As you probably know all of the flavoured hand rolling tobaccos are being discontinued as it will become illegal to sell them as of May. Not to worry! we have the solution; Tobacco Flavour Sprays. These little sprays allow you to flavour your tobaccos just as you used to have them, ranging from Cherry and vanilla to peach, these are the perfect solution to a bad situation. 1. Spray directly onto tobacco in pouch. 3. Leave spray to set in over night. Cherry and Vanilla: Always a popular flavour so this is obviously the one that sold out first. It's just as good as you'd expect; Cherry takes the forefront with a fresh sweetness, while the vanilla rounds it off with a nice creamy character. Peach: Not a flavour we are always drawn to, but this one's pretty delicious; a very tangy almost juicy flavour! If you've had the Auld kendal peach then I would definitely recommend this. We here at Turmeaus feel it actually adds a stronger flavour but you will have to judge for yourself. Vanilla: A classic choice for flavoured tobacco, so thankfully the spray nails it. It smells and tastes very natural, almost as if you were just spraying actual vanilla essence/extract on to your tobacco. Delicious! Black Cherry: Another classic! We do sometimes find that cherry flavour tobacco can sometimes be a bit "Meh" and taste and smell more like "Cherry flavouring" rather than actual cherries (if that makes sense) but this spray really tastes like pulped cherries! Very impressive... We will have to check the bottle for stones! Coconut: Wow! This flavours seems like you accidentally rolled a cigarette with Malibu instead of tobacco! Some coconut blends can be a little sickly, but this one's very well balanced. Blueberry: It makes your little pouch of tobacco smell exactly like blueberry muffins. People seem to use "Good enough to eat" quite loosely, but have a smell of this one and you might be genuinely tempted! This is a fine cut hand rolling tobacco that is made using mild to medium blend Virginia Tobacco. 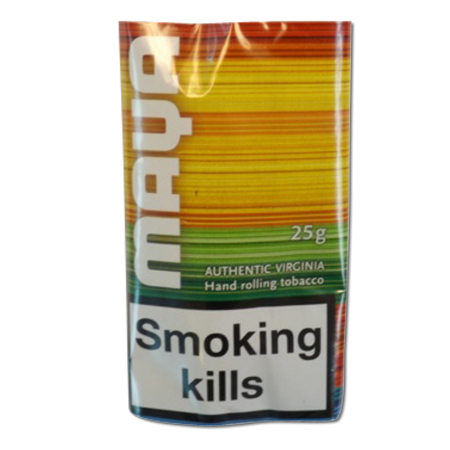 The Maya is blended from superior Virginia tobacco's using traditional production methods for a pure and quality flavour. As it is quite a light strength tobacco this goes perfectly with the tobacco sprays.